Now that you have a confirmed reservation now is the time for planning your arrival! We have listed a link on our website to Google Maps. The link will allow you to get directions from any starting point. Our office check in location will auto-fill in for your convenience. The County of Ashland requires that all food and condiments be removed after each reservation. Therefore, if you are planning on cooking please bring your own condiments (salt, pepper, oils, ketchup etc.) for your stay. If you are heading to the beach we ask that you please bring your own beach towels and not take the bath towels from your rental home. Each property does have a coffee pot with filters, coffee is not provided with the exception of our five rooms at the Island Inn. If the home that your are renting has a charcoal grill, please bring your own charcoal & lighter fluid.Gas grills have propane provided by the homeowner. We provide one bath towel and one wash cloth per listed guest on your reservation. Please do not remove bath towels from the rental property. 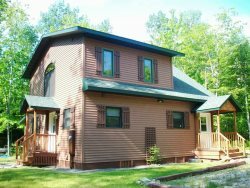 Some of our homes offer washer & dryer please confirm with Madeline Island Vacations or check the amenities on the website to see if your home has a washer & dryer. If your home does have a washer & dryer we ask that you do not wash Madeline Island Vacation Towels at the home. We provide fresh towel turn over mid-week on rentals that are greater than seven days. A fee up to $250 will be assigned if smoking takes place inside your rental home. What about parking and boat trailers? Generally no more than 2 cars can be parked at any home at any time, unless otherwise approved by Madeline Island Vacations. If you bring a boat you must get approval for trailer parking prior to your arrival. The Madeline Island Marina offers boat launching services; and, temporary slips for your convenience. We ask that you inform your guests and visitors of this policy; and, adhere to it to avoid forfeiture of your deposit or other fees. Furniture should not be moved during your stay; if you did move any furniture please replace it to the original location you found it upon check in. Bath towels gathered and placed on the bathroom floor. There is no need to strip the bed; our housekeepers will take care of that upon cleaning. Pick up any outdoor areas of any trash or debris, including cigarette butts or dog waste. All trash should be bagged in the appropriate garbage & recycling bins provided. ** Please Note*** Failure to follow check-out procedures or otherwise leave the property in its original condition may result in charges to your credit card. Be sure to report all accidental damage to the office immediately in order to avoid these charges. What if a property becomes no longer available after I have rented the property? Madeline Island Vacations complies with all reservation requests for specific vacation properties. However, due to ownership changes, properties being removed from rental use, mechanical problems, or other unforeseen circumstances, we cannot absolutely guarantee a specific rental property. We reserve the right to change assignments without notice or liability if the property becomes unavailable. When comparable accommodations are not available, guests will have the option of selecting from available properties at the published rate or receiving a complete refund of their reservation deposit.